A woman, on the average, can lose approximately 5 pounds in two weeks and approximately 12-15 pounds in just six weeks. All dieters lose, on the average, 1 inch per Pound. And you can lose this weight naturally with no hunger...thanks to our famous dietary supplements! "I am an athlete and have run half-marathons all my life but couldn't lose the extra 20 lbs. until I went to Diet Center"
life and I'd never give it up". "Diet Center teaches you how to eat for life"
"It's the only place in my life that I can talk about me"
"I am over 60 and lost 26 lbs. with Diet Center and have never felt so good and I look years younger"
"I have 100 lbs. 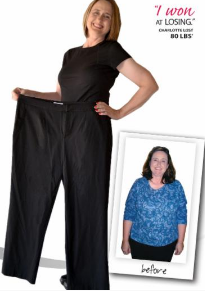 to lose and I know my best chance of losing it is with the support of Diet Center"
"I went from a size 14 to a size 6, years ago with Judi at Diet Center, and still am on maintenance and just threw out my old size 14 clothes!"